Historic location on the main square of "Pjaca" in Split, and proximity to the Diocletian's Palace, nightlife, shops, sea, and transportation. Emperors Retreat for Your Stay in Split! Hotels in Split can be expensive, and the amenities are not always there. Our apartment offers classic furnishings and decor for your stay with the touch of luxury. Emperor’s Retreat apartment itself consist of a bedroom, living/dining room with double sofa bed, well equipped kitchen, and the bathroom. Air-conditioning keeps you cool during hot summer days, and warm during the winter months. Wireless broadband internet connection, satellite TV, DVD player, and music player are there for your chill-out moments during your vacation in Croatia. Apartments great location is close to nightlife, entertainment, shops, historic places, Diocletians Palace, sea, and beaches. Car is not necessary and you can get anywhere you want in Split by walking distance. Apartment itself is located in the building with the history. It used to be the property owned by nuns who lived in this building. History and culture shows in every corner of the apartment history is engraved in the old stone walls. Right next to the building and the apartment, there are numerous churches, museum, shops, restaurants, Diocletians Palace. Imagine strolling down narrow streets of downtown Split, checking the old Roman walls of the emperor Diocletian. Or you prefer a shopping spree. Split has a great selection of small shops. Traditional jewelry shops are worth your visit, and the selection of golden jewelry is great. Hungry? No problem. Local produce and fish markets are steps away for your local food sampling. Various restaurants offer convenience for those who want to spend more time exploring and sightseeing, and less time in the kitchen. Exploring Split on foot is easy from our apartment. Visit the port and watch boats sail off in the sunset. Take sailing trips to local islands, or just stay at the local beaches (“Bacvice”) and dip your feet in the water. And do not forget the hiking trip to “Marjan” hill for that special picture perfect moment in Split. There is also 1 double sofa bed in In the living room. 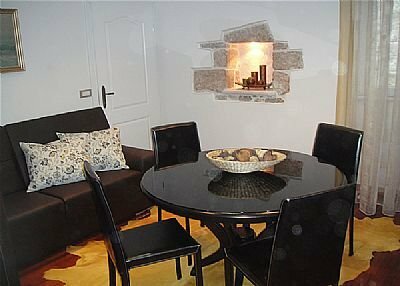 The apartment is overlooking towards the main square of Narodni Trg in Split. There are numerous shops, museum, and nightlife located there. However, the apartment is still on a quiet location (occasional noise).